I am so excited about your interest in a lifestyle newborn photo session and hope to be a part of welcoming your new family member into the world! I know that you have been doing research on finding a photographer that is the right fit for your growing family! Because each photographer has their unique approach to providing you service, this guide is designed to help you understand the We, The Light Photography experience and what to expect from me. This is why it is important for you to read through this guide so you can make a decision if I will be a good fit! My motto is capturing real people in real ways because no one is perfect, but every one has a light that deserves to be captured. The goal of lifestyle photography is to capture a subject in a non-intrusive, natural and real-life way. It takes a newborn and their family exactly as they are - without expectations. I fell in love with lifestyle photography from the beginning of my career because it allows people to be imperfect, to be real, and for me to capture emotions and interactions that would be otherwise lost in a formal, studio setting. With your lifestyle newborn session, I capture you and your baby in the comfort of your home in a real-life way. I have you snuggle up and hold your newborn as you naturally would. I have you cuddle up alongside your significant other and document the way you two look at the little human you so beautifully created. Lifestyle photography is a chance for you to embrace how much stinkin' love you have for your newborn and capture sweet, candid moments with them. You can review my newborn portfolio reflective of my style here. DO YOU OFFER POSED SHOTS OF MY NEWBORN? Because I know that it is important to many parents to have images of just their newborn I do offer individual portraits as part of the session. I do not do high-end newborn posing (that is a craft to master all on its own), but I love to wrap up your little one in a blanket and capture their sweet face, those eyes just like dad's, their tiny fingers and toes in a natural way. DO YOU HAVE PROPS FOR THE INDIVIDUAL PORTRAITS? My style is more natural and raw by capturing the beauty of your baby exactly as they are - this means, I put them in natural poses and positions - I don't force them into poses that are unnatural to them. On occasion, I do have clients that provide headbands or a special outfit for the individual portraits, and I am more than happy to accommodate that, but please let me know ahead of time if you do plan on having additional props. Your session will take place in the comfort of your home. I absolutely love coming to your home because it puts you more at ease and I have always received great feedback from my clients on providing in-home newborn photography. Your newborn already knows your home and is comfortable there, which allows me to capture the most raw and organic images. And, in all honesty, your baby poops and pees a lot and it is really nice to be at your home where it’s much easier to change a diaper or an outfit. WHERE DOES MY SESSION TAKE PLACE? If you are asking this question because you don’t feel as though your home is picture-worthy, please stop there. Your home is beautiful and homey in its own unique way! I promise you that I have been to tons of homes in which the parents’ may not have felt it was picture-worthy, but 100% of the time I am able to find beautiful locations that make for amazing pictures! However, if you are moving or live in a dungeon with no windows, we would probably need to have your newborn session in a different location. For an additional charge, we are able to rent a studio space or a hotel room in which we can still capture beautiful images. WHERE IN MY HOME WILL YOU CAPTURE IMAGES? Your newborn session cost is $450. If you live more than 20 miles outside of my location in Erie, CO, I do add on $0.50 per mile beyond those 20 miles. If you have questions on what my travel rate would be for you, please reach out – but most of the time it’s only a few dollars more to help me cover travel time and fuel. WHAT IS THE COST FOR A NEWBORN SESSION? WHAT IS INCLUDED IN THE SESSION PRICE? - My Newborn Prep Guide so you are confident when I arrive to your home – this includes tips on preparing your newborn for their session so they are the most comfortable (and cooperable), what to wear for your session, and a timeline of what your session will look like. WHAT ELSE CAN I EXPECT TO PAY BEYOND THE SESSION PRICE? Nothing! I do not require you to pay additional money for your digital images or require you to print through me. However, because you invested both time and money into your newborn session, I do offer all clients easy printing services via your online gallery where you can order professional quality prints, canvases and artwork of your memories. CAN I PRINT MY OWN IMAGES? Yes, I provide you with the print release and the final high-res images. 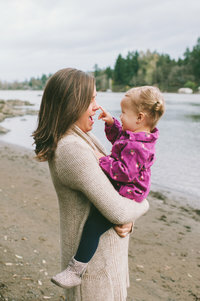 However, since you spent hundreds of dollars on your session, you invested time into deciding on outfits and poured out your love for your little one on the day of your session, I would hate to see your investment go to waste by ordering low quality prints through places such as Walgreens, Target, Walmart, Costco or Shutterfly. You are probably asking "why, Larissa?" And that is a great question! In this article, I physically show you the difference in print quality and how, for usually only a few cents more, you can easily order high quality, professional prints from www.mpix.com that are delivered directly to your door. HOW LONG WILL MY NEWBORN SESSION TAKE? I typically spend 1 1/2 to 2 hours in your home. This includes both individual portraits of your newborn as well as lifestyle, candid images with mom. dad, and any siblings included. HOW MANY IMAGES DO I RECEIVE FROM MY SESSION? I don’t ever limit the number of images I deliver to you. However, I only deliver the images you and your newborn look the best in. You can expect, on average for a newborn session, 50+ final, edited images. DO YOU EDIT ALL THE IMAGES? I meticulously hand-edit every single image so that when I deliver it to you, it is print ready. When it comes to photoshopping and touching up, I do minor edits. I want you and your baby to look natural and not like some glowing, supernatural human being with zero wrinkles. Now, I do edit out blemishes and provide minimal enhancements. If your baby has a rash or baby acne, I smooth that out as well. HOW LONG AFTER MY SESSION DOES IT TAKE TO RECEIVE MY IMAGES? Going through the hundreds of images I capture during your session and picking out the most amazing ones that I know you are going to love takes time. I then hand-edit each of your images individually to ensure that every picture is print ready. While I always aim to deliver your final images as soon as possible, you will receive them no later than three weeks after your session. WHAT DO WE WEAR FOR OUR SESSION? As a part of the Newborn Prep Guide that I will deliver to you when you book your session, I provide recommendations and suggestions on what to wear for both you and your newborn. OK, ALL OF THE ABOVE SOUNDS LIKE A GREAT FIT FOR ME! HOW DO I BOOK? If you have decided to go ahead and book your newborn session, I cannot wait to help welcome your newest addition into the world! All you need to do is email me, Larissa, and I will handle the rest! WHEN SHOULD I REACH OUT TO YOU TO SCHEDULE MY NEWBORN SESSION? Now! No, seriously! I only accept a limited number of newborn sessions within a certain time frame to guarantee availability when your baby arrived. Beyond planning for your in-home, lifestyle newborn session and making sure you and your little one are prepared, the timing of your session makes a big difference. I recommend scheduling your newborn session within the first week or two of birth for so many reasons. HOW DO I SCHEDULE MY NEWBORN SESSION SINCE BABIES CAN BE UNPREDICTABLE ON WHEN THEY DECIDE TO COME INTO THE WORLD? I only book a limited number of newborn sessions within a certain time-frame so that I am able to be 100% committed to scheduling a time that works with you after your baby is born. If you reach out to me for the first time after your baby is already born, there is a chance that I will not be able to accept your session or only have less-desirable session times available because of my commitment to the parents who I have already booked in that time-frame. Because of this, I always recommend reaching out to me at least a month or two prior to your due date, so I can get you scheduled within a time period around your due date. This way, I know I can absolutely guarantee a flexible session time with you once your baby arrives. Then, when your baby is born, just notify me and we will schedule a time that works best. HAVE ADDITIONAL QUESTIONS? READY tO BOOK YOUR NEWBORN SESSION? PLEASE FILL OUT YOUR CONTACT INFORMATION BELOW AND I WILL BE IN TOUCH SHORTLY!